Jim Bunting and Tom Kellogg teamed up with Bill Lang To bring the AVX from concept to reality. (The complete 6 page article by John Hull appears in Avanti Magazine issue 174). Craig Kember, a former student of Tom Kellogg, and a former senior designer at Toyota's Advanced Design Studio, has been commissioned to further advance the Avanti's evolution. For the AVX4 they captured the original spirit of the Avanti but brought it forward with new technology without losing its proportions, stance and sculpture. The concept has taken many of the 63 design cues and moved them into the future-- things like the round headlights, Coke bottle shape, crease on the side, etc. The Avanti had so much charaacter to follow that by separating the design thinking from the old technological limitations those elements still capture the racy spirit of the original and add a whole new futuristic dynamic. This is definitely one Avanti styled for tomorrow! Illustrations by Craig Kember. 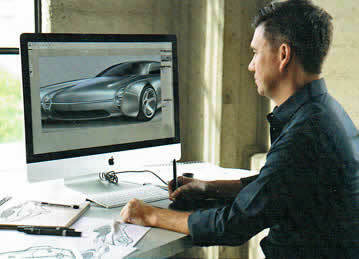 Designer Craig Kember with one of the AVX4 drawings. Photo courtesy of Lesley Bohm Photography. Front and rear views of the new AVX4 Avanti Concept.